DJzone DJ Magazine :: CHAUVET SlimPAR Pro RGBA Brilliant! CHAUVET SlimPAR Pro RGBA Brilliant! As we enter this new age in lighting we are seeing a number of LED fixtures arrive on the scene. Some are geared for the entry level DJ, while others have their place in more of a stage atmosphere. 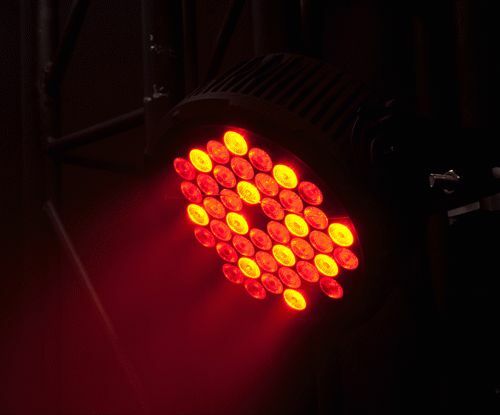 Today we look at what could be a cross-over luminaire, the CHAUVET SlimPAR Pro RGBA LED. This is a well built light that is housed in a hefty aluminum shell that apparently acts as a heatsink, just in case the light gets hot, we ran it for 24 hours it barely got warm. The forty-two, one watt LEDS are extremely bright. Using either DMX or the onboard control panel, we were able to produce rich "warm" colors that were void of that usual LED harshness you normally see when using an LED fixture. The color mix was almost spot on due to the units focused lens array. There was almost no color bleed or shadowing. We liked many features of the CHAUVET SlimPAR Pro RGBA including the lockable IEC power cord that will never have you worrying about the power coming disconnected up on the truss. The AC power can also be "daisy-chained" with a convenient built-in receptacle on the back. On the front of the light there are small lenses over each of the LEDS to give them focus and assist in the color mix. It comes stock with the wide flood lens array which we found to be very versatile, but if you wish to have a tighter beam for a more focused light, you can easily install the narrow beam lens array that is available separately. The ease of manually mixing colors on the light and the fact it "remembers" the color you mixed were big pluses. The only downside was the overall unit weight, but it is nice to finally "Feel" like you have a light worth the money you spent. We call the CHAUVET SlimPAR Pro RGBA a cross-over light because we can see this being used by high-end DJ companies, lighting designers and definitely in stage applications. It gives a wonderful color mix and is very well built. I could use a number of words to describe the SlimPAR Pro RGBA, but will keep it simple and to the point. The CHAUVET SlimPAR Pro RGBA is positively "Brilliant".